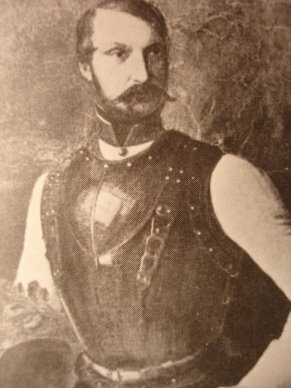 Prince Karl von Solms-Braunfels was born on July 27, 1812 as Friedrich Wilhelm Karl Ludwig Georg Alfred Alexander, Prince of Solms, Lord of Braunfels, Grafenstein, Münzenberg, Wildenfels and Sonnenwalde at Neustrelitz, the youngest son of Prince Friedrich Wilhelm von Solms-Braunfels and Princess Friederike von Mecklenburg-Strelitz. Like many German royals he had an illustrious family tree and counted among his relatives Queen Victoria of Great Britain and Prince Albert of Saxe-Coburg-Gotha, Tsar Alexander I of Russia, King Leopold I of the Belgians and Prince Frederick of Prussia. He was known for being well-connected, handsome, romantic and a little on the wild side; which sometimes got him into trouble. After joining the Prussian army (notoriously strict for its discipline) even one as high born as the Prince was sentenced to four months in prison for being absent without leave for a short time. In 1834 he made an unequal marriage and fathered three children before being pressured to divorce his wife and send her away with a nice title. That same year he entered the Austrian Imperial army as a captain of cavalry; as high-born romantics with more dash and daring than caution tended to. He served in the Balkans, Bohemia and the Rhineland which is where he happened to read a novel by Charles Sealsfield about the newly independent Republic of Texas as well as two other books dealing with the geography and immigration possibilities of the Lone Star republic. Like many others before and after him, Prince Karl von Solms-Braunfels caught ‘Texas Fever’ and he joined the Adelsverein (organized in 1842 and reorganized in 1844) which pushed colonization in Texas with the idea of creating a “New Germany” there. The Prince worked tirelessly to raise funds and the profile of the Adelsverein, calling on his royal relatives for support and going on secret trips to France, Belgium and the Isle of Wight (where he met Prince Albert) in the hope of gaining support for the establishment of a colony or colonies in Texas. In 1844 Prince Karl was named commissioner-general of the Adelsverein, charged with leading the first effort of the society to send colonists to Texas. With two pieces of artillery and some fine silverware he went to London, met with the Queen, then sailed to the United States, traveled down the Ohio and Mississippi Rivers and finally to the Republic of Texas, reaching Galveston on July 1, 1844. Ever the romantic, he saw himself as a trailblazer for German civilization, the founder of a “new Fatherland on the other side of the ocean”. He wrote, “The eyes of all Germany, no, the eyes of all Europe are fixed on us and our undertaking: German princes, counts and noblemen…are bringing new crowns to old glory while at the same time insuring immeasurable riches for their children and grandchildren.” This was to be a very European and specifically German undertaking as the Prince was not terribly impressed with the Anglo-American population and wanted his colony sufficiently distant from their bad influence. He first bought land on Matagorda Bay to establish a port (modestly named Carlshafen -later known as Indianola and now a ghost town) and advised the Adelsverein to purchase more land than what they already had in the distant Fisher-Miller Land Grant. When his first crop of colonists arrived he led them into the interior of the country, stopping them at Victoria while he rode ahead to San Antonio to purchase a piece of land on the Guadalupe and Comal Rivers from Raphael C. Garza and the aristocratic Juan Martin Veramendi. The colonists came and on Good Friday, March 21, 1845 the settlement of New Braunfels was established, still a bastion of German culture in Texas today. Set to marry the widowed Princess Sophie von Salm-Salm, daughter of the reigning Prince of Löwenstein-Wertheim-Rochefort, the Prince even started construction of a castle/fort named Sophienburg in honor of his beloved. However, when he returned to Germany to collect his beloved (whom he married on December 3, 1845) she recoiled at the prospect of moving to the wild frontier of Texas for the life of a colonist and so the Prince remained in Europe, never to see his namesake colony again. Resuming his military service he wrote a short book on Texas geography and a memoir which he sent to Queen Victoria, interestingly predicting a future clash between the expanding United States and Europe as the center of world trade. Prince Karl predicted that if the U.S. was able to expand to the Pacific coast America would win this struggle and that the nations of Europe should come together to block the expanding American empire with colonies and, again very interestingly, the establishment of a strong monarchy in Mexico. He also suggested that British emancipation of the slaves would help in the achievement of this. Despite how eerily prophetic this was, his words went largely unheeded. However, though far removed from Texas the Prince never lapsed in his support of the Adelsverein and their goals. In 1847 he helped recruit a group of idealistic young Germans to settle the original land purchased by the society in the Fisher-Miller Land Grant. Also in 1846 he left the Austrian service and became a colonel in the Hessian cavalry. He later attempted to rejoin the Prussian army but was rejected. Still looking for military glory Prince Karl rejoined the Austrian army and by 1859 was a brigadier general. He fought in the unsuccessful war against Prussia in 1866 where he met with defeat as a corps commander. Nonetheless, by the time he retired in 1868 he had attained the rank of field marshal. Prince Karl von Solms-Braunfels, father of New Braunfels, Texas, died on November 13, 1875, his beloved wife Sophie following him the next year. In his own time some people called him a “Texan Don Quixote” while others hailed him as the last knight of the Middle Ages. He was restless, at times impetuous, vain and far from perfect but he was also a man of vision, much more far-sighted than he was given credit for at the time. Prince Karl also traveled through Texas with a couple of valets, a personal chef and a huntsman. He occasioned considerably hilarity at one home where he was a guest when another guest witnessed the prince being hoisted by his valets into his skin-tight trousers one morning. Alas, the final months of Prince Karl's tenure as commissioner-general in Texas were a bit of a bust; some of it was not his fault as they coincided with the start of the American war with Mexico ... but many historians have described the movement of later settlers from Karlshaven to New Braunfels as a death march. I had heard that Prince Solms-Braunfels, being of the monarchist cut and nobleman starting a "New Germany" wherein he and the Adelsverein would own the land and their subjects would be surfs on it, brought him trouble with the founders of Texas and the ideology of anti-feudalism of the Anglo settlers. This I heard eventually resulted in a warrant for his arrest being issued to the Texas Rangers and that he left Texas to escape capture. It seems a man driven by such a strong vision of "New Germany" in the new world where all were watching, would require more to remain in Germany than the love of his re-arranged second wife. And the history above does take note that the Prince was not comfortable around the Anglos who had a very different idea about what the rights of the people were and their distaste of royalty and feudalism.